Videos are proven to successfully engage visitors, and keep them on your website longer. However, you have to make sure the layout and user experience is well configured. That’s where WordPress video themes can help you. We know finding the right theme is tough. 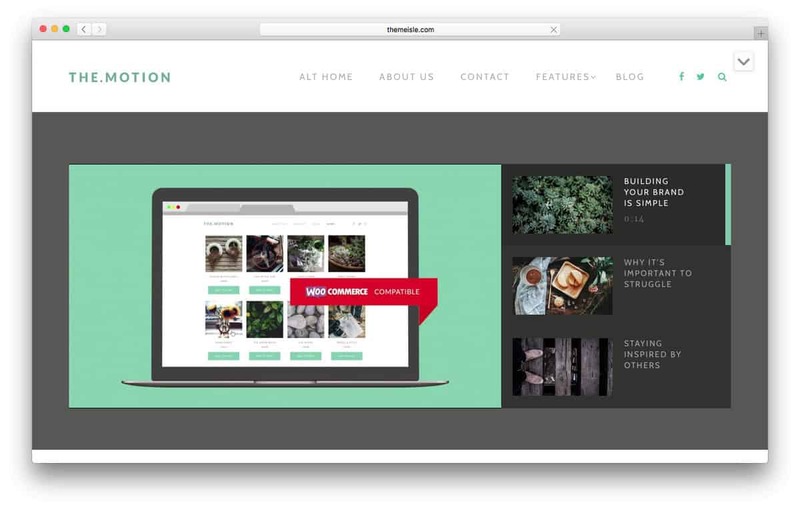 That’s why we’ll share our 20 favorite WordPress video themes. You’ll learn what features they have, and what visual aesthetic they work best with. 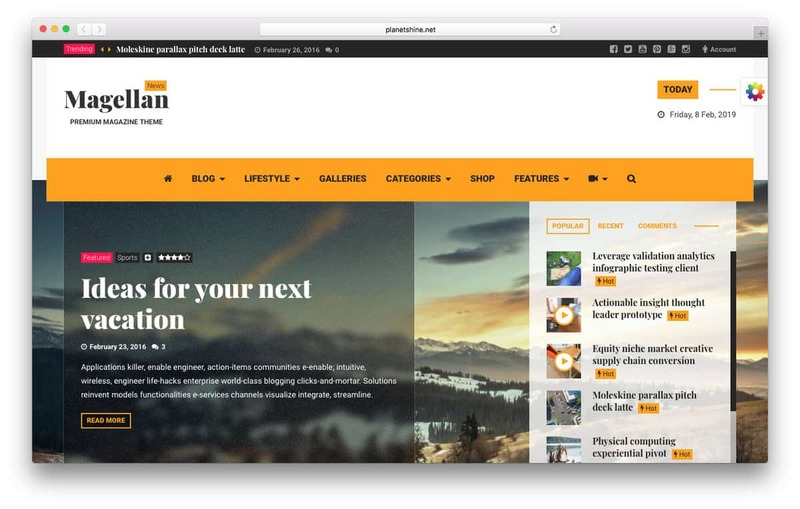 PenNews is a versatile WordPress video theme, suitable for every project. With a selection of 100+ demos, you can be sure to find one that fits your needs. Anything from a news portal, magazine, online shop, video portfolio, or landing page. All the demos are highly customizable. With 40+ content blocks, you can design your content as in-depth as you wish. The drag-and-drop builder will make customization stress free. Autoloading next posts helps grow traffic. It saves your users time and allows you to present the very best content. That’s a great way of keeping visitors longer on the site. Site loads 5x faster using Accelerated Mobile Pages (AMP) and 10x faster using Facebook Instant Article. Vlog advertises itself as the best WordPress video theme. Video sliders let users go through content comfortably – no need to scroll down and search for videos. That saves time and presents a more modern solution for watching multiple videos. Visitors can use comment boxes to share feedback or to start conversations with other users. You can combine the video with written content, images, and a gallery. You can also highlight videos by using the sticky video feature. VideoTouch displays all of your best videos on a unique slider. It definitely gets your visitor’s attention and makes your site unforgettable. This WordPress video theme is highly customizable – it includes from two to 12 columns of content options and five styles of post listing. Its powerful meta options let users tweak every page, post, sidebar, thumbnail, link, and more. 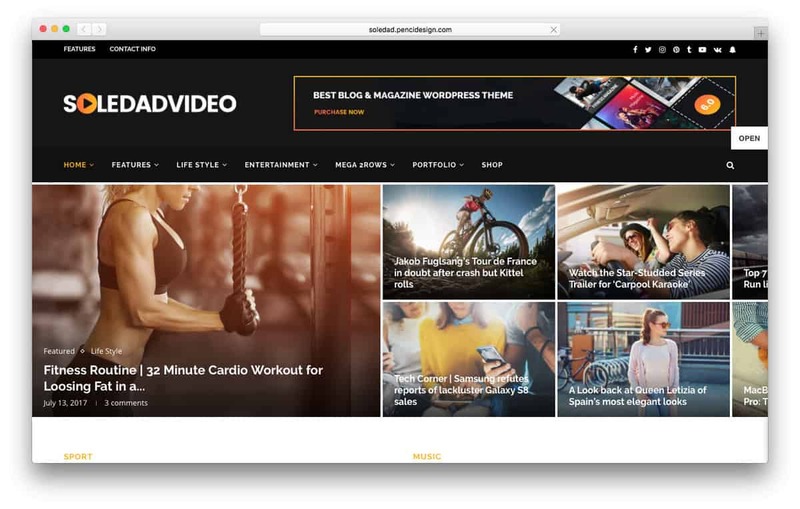 The Soledad WordPress video theme has 4000+ homepage options and 1000+ slider and blog combinations. No wonder it’s called the biggest theme ever for blogs and magazines in 2018. Soledad lets you add elements from different demos into your site. You can choose any sliders, blog layouts, and post templates to create the best website for your needs. Possibilities are endless. 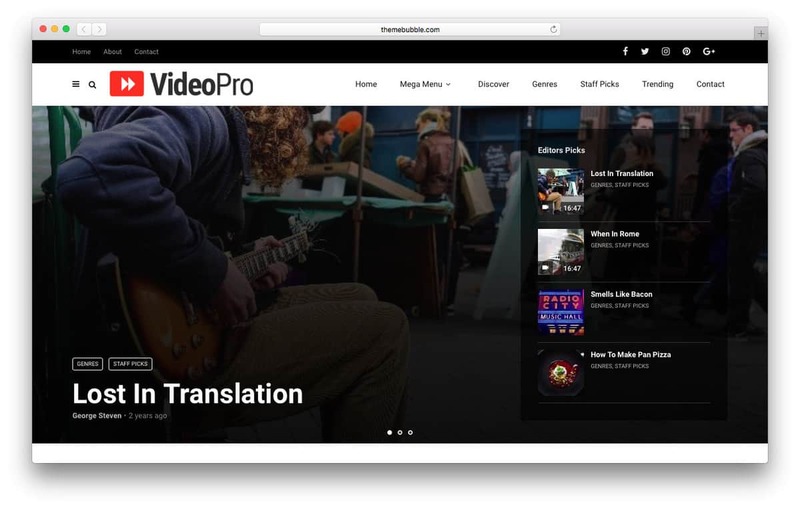 VideoPro combines a beautiful front-end with endless functionality. Everything you want to create a great video-sharing website. Front-end video submits options make gathering content easy. Users can easily contribute, while VideoPro credits each channel. With this WordPress video theme can also host videos in different ways. VideoPro supports episode buttons, for easily hosting series or video courses. Another option is a video playlist where you can showcase videos from various content creators. MagPlus is an excellent magazine-style WordPress theme. It’s ideal for hosting blogs, news sites, and video content. 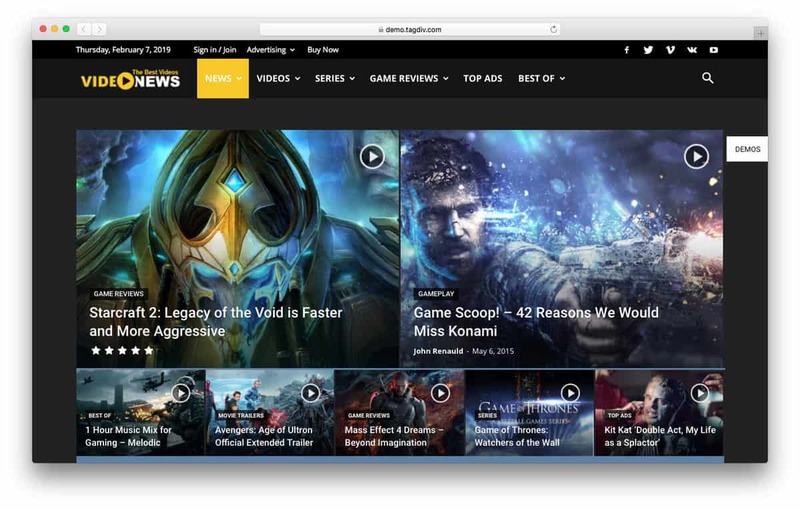 MagPlus gives you a lot of control over the aesthetic of the site. The 40+ pro demos give you various options. But if you can’t decide on one, you can use 270+ layout variations in different combinations. The theme also takes care of the technical aspects. It claims to be the most SEO optimized theme with a built-in cache system allowing ultra-fast load speeds. Starting a video-based project is a lot easier with Vlogger. This WordPress video theme offers many ways to improve content presentation. You can combine articles and videos into a single post. While reading the article, you can still watch the video on an adjustable collapsible sidebar. Click on the video cues, when you want to skip some parts. Interactive playlist cards are another way of showcasing content. On them, you put the video playlist, description and video recommendations. All elements are separated by tabs which are accessible by a single click. VideoTubes mirrors the look of one established video-sharing platform – YouTube. This gives a sense of familiarity which might work great for your target audience. The WordPress video theme doesn’t only mirror the look, but also provides the same features as the other platform. It lets visitors submit videos and offers a like button and a view counter. 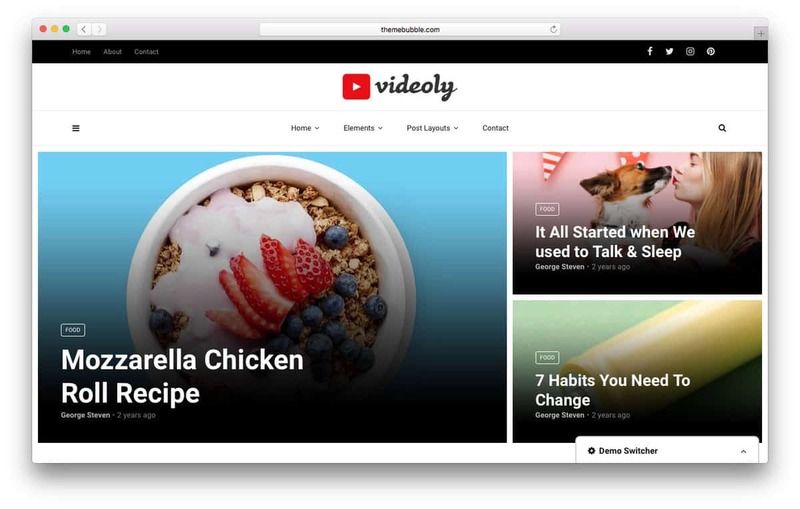 Videoly compiles all of your content and makes it accessible in a single domain. The theme offers 6+ article template options. They allow large background pictures behind the title, can display a video before an article, or recommend other content on the sidebar. All templates have large font options and visually pleasing compositions which better the reading experience. For video content, Videoly has a lights option that blurs background content once the video starts playing. The feature let you focus on the content the way you would in a movie theater. The theme includes free a Photoshop toolkit which makes content creation easier. True Mag encourages visitors to stay longer by using a recommendation system. You can modify video recommendations based on different categories. This way, you can convince visitors to explore various topics you offered. The view count and rating options further improve the recommendations your visitors receive. 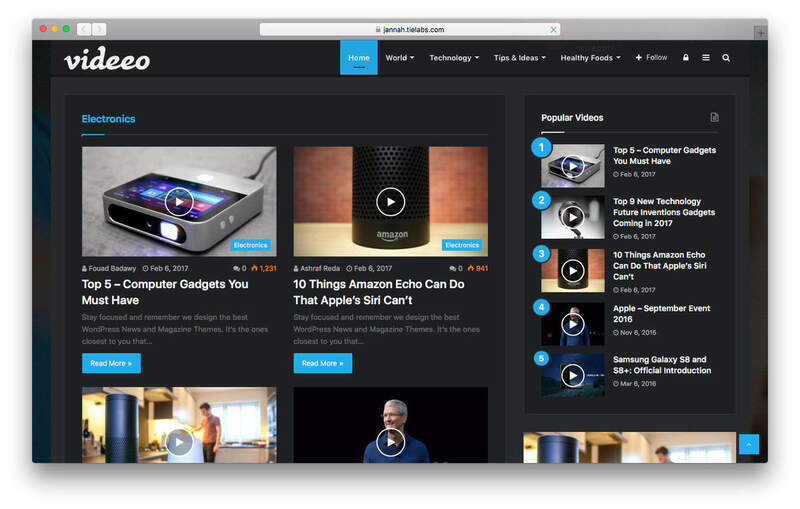 Snaptube is similar to the VideoTouch WordPress video theme. Both have a unique header homepage to display the best or most popular videos. The only difference is the VideoTouch header, which can scroll horizontally, while Snaptube works like subtitles on TV. 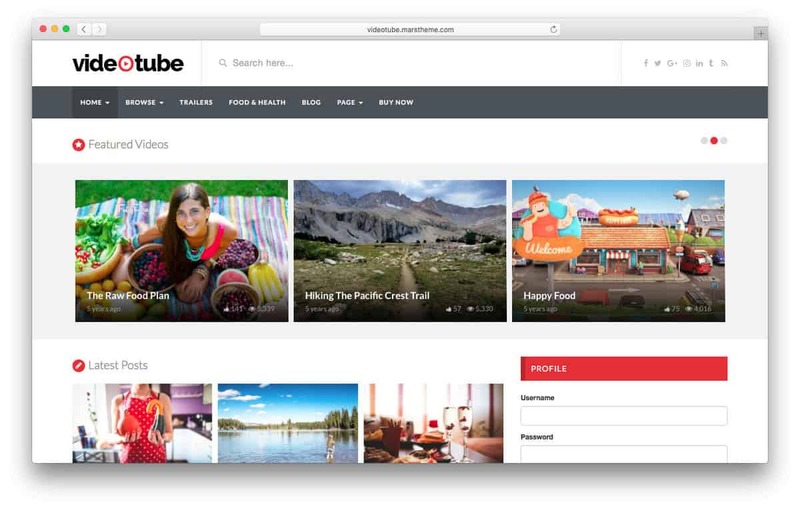 The left sidebar of Snaptube provides the wealth of features the theme has – video submission, blog, featured content, contact forms, and account management. If you wish to configure the front-end yourself, use the intuitive drag-and-drop Frontend Page Building. FilmMaker knows that aesthetics are an essential part of any website. That’s why it has many beautiful and functional elements built in. Anyone who likes practicality will definitely love the pre-built website. A single click and you have a beautiful video hosting platform of your own. If you work with other teams, the WordPress video theme will make crediting other people who helped the creation of your content easy. It dedicates a space to list everyone who was a part of your project. For detail-oriented people, FilmMaker works wonders. Without any coding knowledge, you can customize the site using the Visual Composer page builder. To set up sliders, you can choose Master Slider or Slider Revolution. Both enable great looking sliders with many elements available – images, videos, flying objects, buttons, link, etc. Beautiful parallax effect and video background. Complete selection of visual icons. If you believe in “less is more,” Video World should be your pick. This theme offers three-page template options. Each one maintains a modern and simple look with a dark background and large fonts. For viewing videos, the theme provides a full-width page to ensure the best viewing experience. Although the theme offers easy customization, you really don’t have to tweak everything. 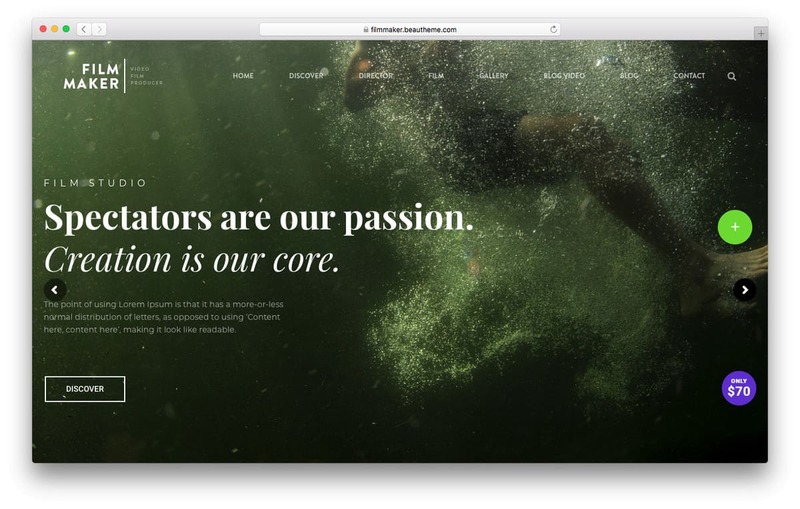 The design helps your content stay front and center. TheMotion is a clean-looking and personal theme suitable for bloggers. The theme makes you look like a pro without being rigid or too formal. 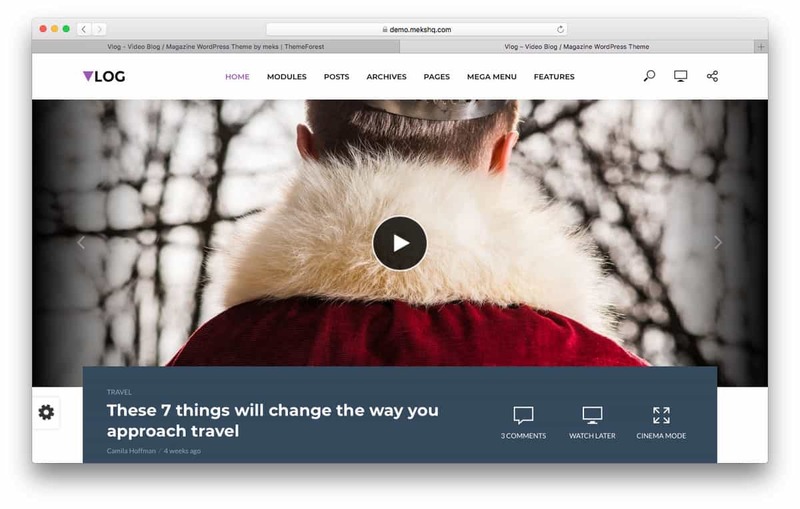 The WordPress video theme offers two different homepages. The first has a large background picture with text, a call to action button, and video thumbnails. The homepage is suitable for professionals who want to highlight their online persona and reach out to a new audience. The second header presents a selection of videos on a playlist. Below, thumbnails are showing the latest content. For any other customization options, TheMotion includes custom background options, a live customizer, and mega menu. Price: Essential ($89); Business ($129); VIP ($199) – for an annual plan. Essential ($329); Business ($449); VIP ($659) – for lifetime plan. The Newspaper WordPress video theme shows off the definition of one-click customization. Using the theme panel, tweaking all parts of the site can be done in one place. Anything from the header, footer, posts, and even technical aspects, translations, and analytics. What’s more, you can customize it without code. You only need to toggle the options available. To see the changes made, you can also use a tagDiv composer. The drag-and-drop page builder will help you visualize 420+ elements you can use to customize your site. Jannah is an Arabic term for paradise. 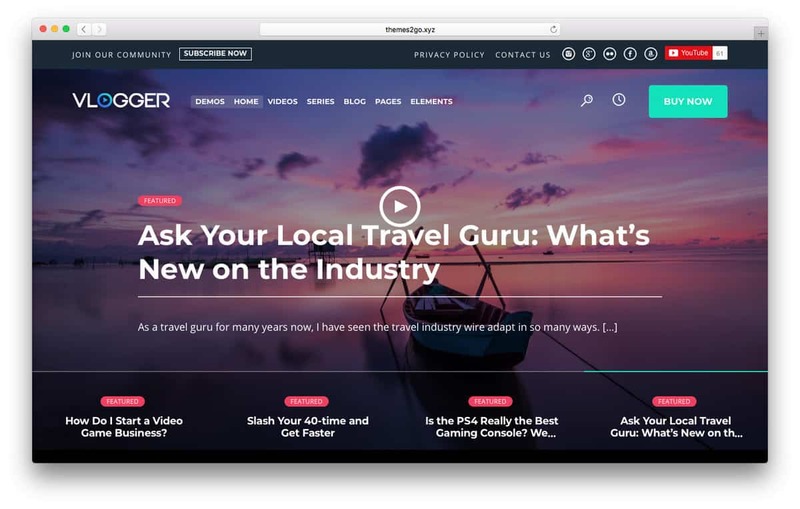 This WordPress video theme is indeed a paradise for content creators. It offers a range of options for header styles, menus, slider layouts, post layouts, etc. Each element is modifiable to match your requirements. To gain traffic, Jannah sends web notifications to alert your visitors about new content. Speaking of monetization, Jannah doesn’t only offer responsive ads but is also compatible with AdBlock Detector. The plugin makes sure you get every penny from advertisement. 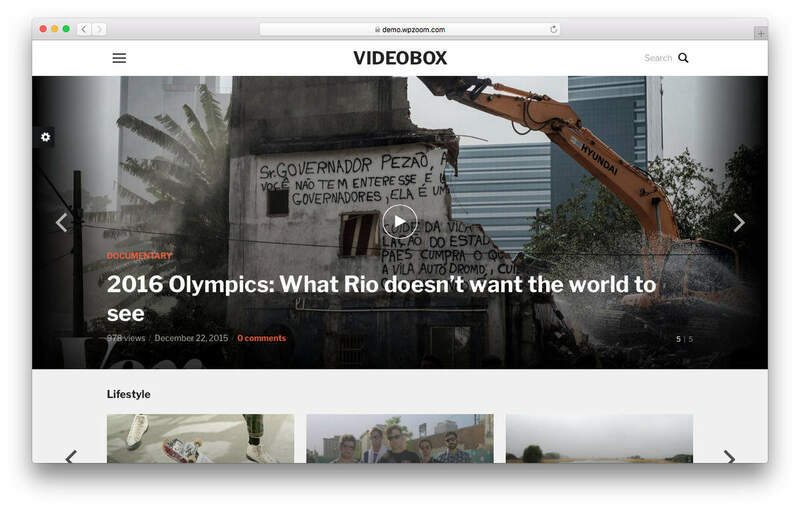 Videobox is tailor-made for video content. The video slider is where you can showcase the content of your choice. It won’t show videos randomly because of Featured Posts Management located on the Dashboard. There you can place the videos you think will attract visitor attention. You can also use the mini version of the slider carousel widget. Use some of it on a page to display videos from different categories or to recommend blog posts. Magellan is good at keeping visitors on your site. The WordPress video theme offers a bunch of features to help visitors enjoy your content easier. Using auto hot articles, your most popular content will be automatically marked ‘Hot’ in the title. The same suggestions can also be placed above or below other content. Another less aggressive way is to activate the smart sidebar. The sidebar occupies white spaces on your site and shows recommended the content of your choice. It will follow through scrolling in a less intrusive way. 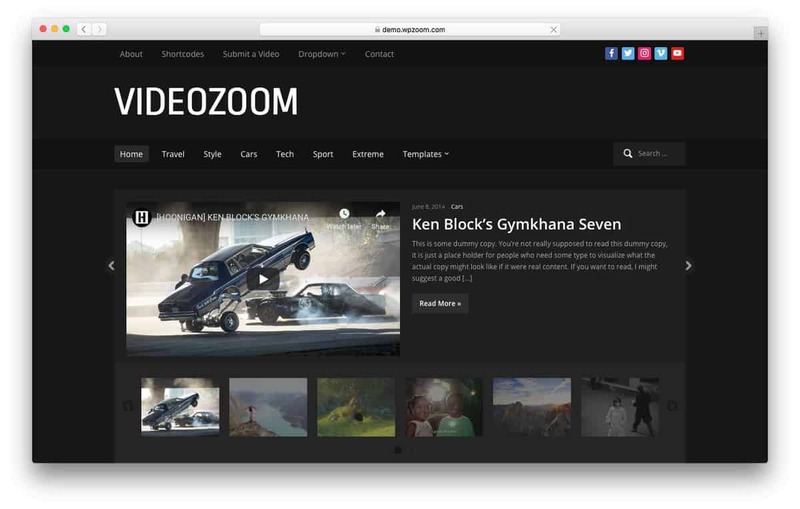 VideoZoom allows you to place many videos on a single page. You can use a video slider to display the most popular ones while showing thumbnails and descriptions. The WordPress video theme has two menus. The first is above the header, while the second is below. The menus create a clearer site structure, making it easier to navigate. The first menu you can fill with any navigation links like About, Submit Video, and Contact. The second one is where you put all the content categories. VideoZoom also has a four column footer. You can use this section to display a short description of your company, link to your Instagram account, or other social media. Inspiro is the perfect choice for exhibiting video content. This WordPress video theme supports fullscreen slideshows that play videos in the background. For more aesthetic options, you can apply an overlay gradient to your video to set the mood you desire. Besides, you can showcase portfolios and images on the slideshow as well. 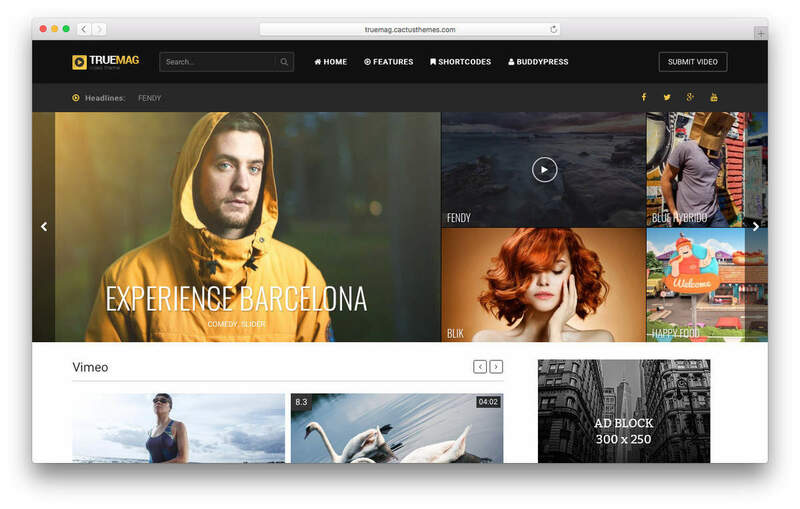 WordPress video themes are good for more than just aesthetics. Sure, they do improve the look of your site, but also provide valuable features that significantly improve visitor video viewing experience. 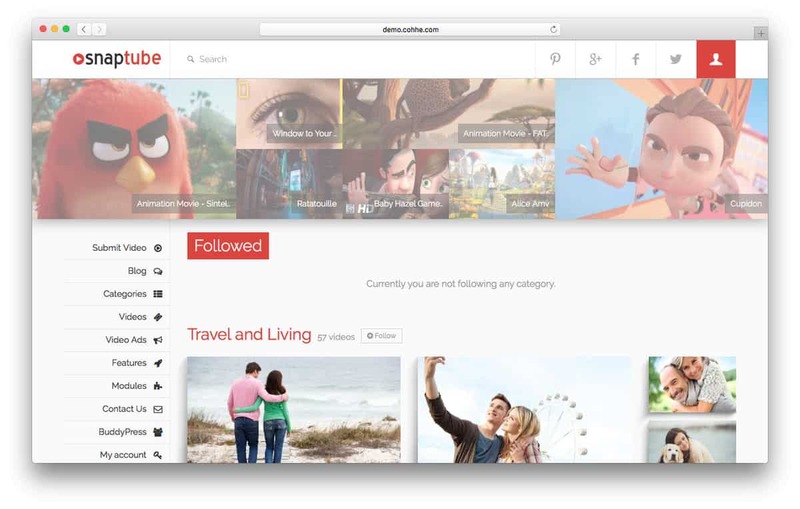 If you’re looking for a theme that has a similar structure as Youtube – check out VideoTube. MagPlus should be your choice if such technical aspects as SEO are your main priority. Such themes as Magellan will make sure, that visitors stay longer on your website. And for the best user experience, try out themes like Vlogger, that allow to watch videos and read your articles at the same time! 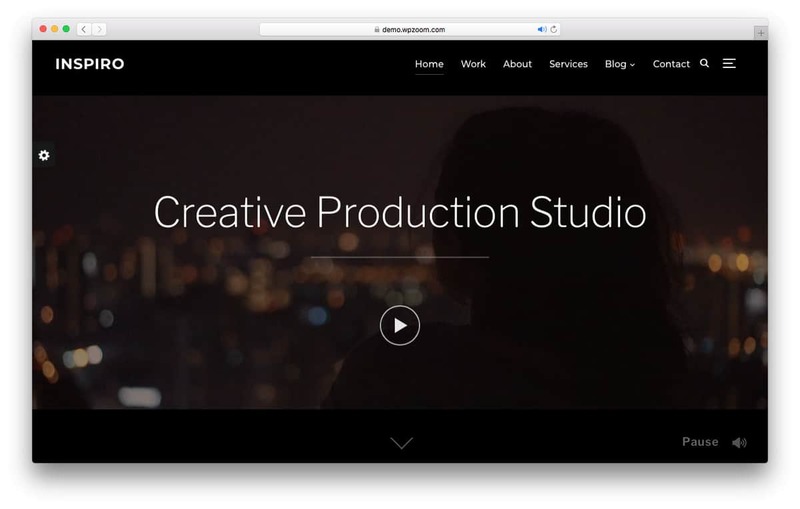 All in all – there are endless choices of WordPress video themes for you to choose from.